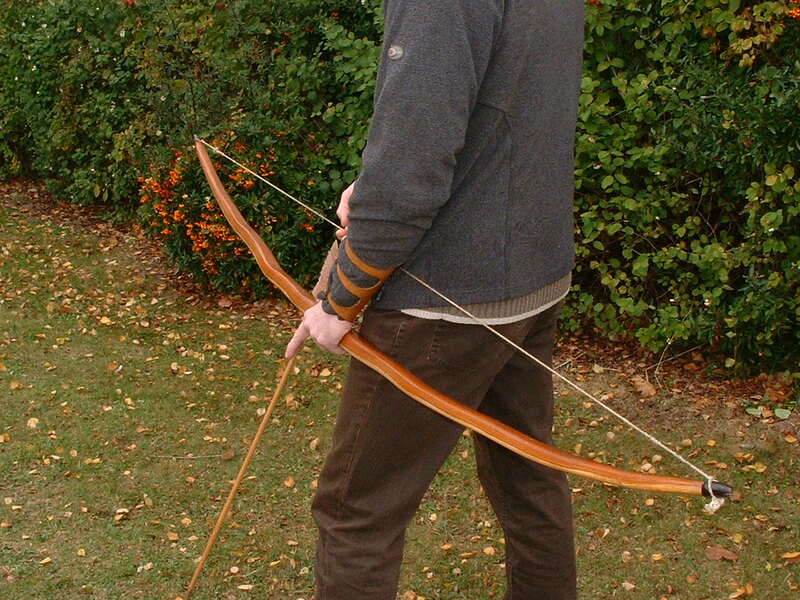 The self-bow has a long history in Northern Europe, being used both in battle and as a hunting tool. 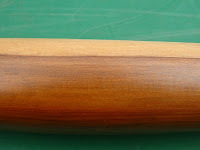 A self bow is made from a single piece of wood (as opposed to a composite bow which is made from a number of components laminated together) and is really nothing more than a spring, made possible by the utilisation of the naturally occurring and combined properties of the sapwood and heartwood. Sapwood is that part of the tree that carries sap up the tree transporting nutrients from one part of the tree to another. The sapwood surrounds the heartwood which is dead wood and has darkened as a result of toxic waste matter. The heartwood imparts strength and rigidity to the tree and when buffeted by the wind it experiences compression, the surrounding sapwood counteracting by taking the tension and helps prevent the wood from breaking. Although branches of yew can yield perfectly good serviceable self bows, because the bole or the trunk of the tree is obviously going to be the strongest and most rigid, it follows that it will supply the best wood for a self bow in terms of strength. 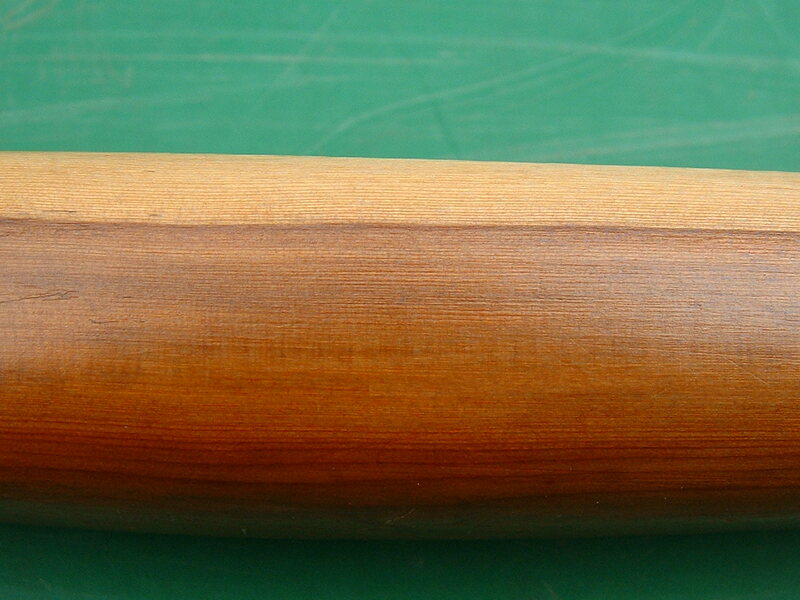 Although self bows can be made from different woods, notably yew, ash, or elm, it is yew that undoubtedly excels. 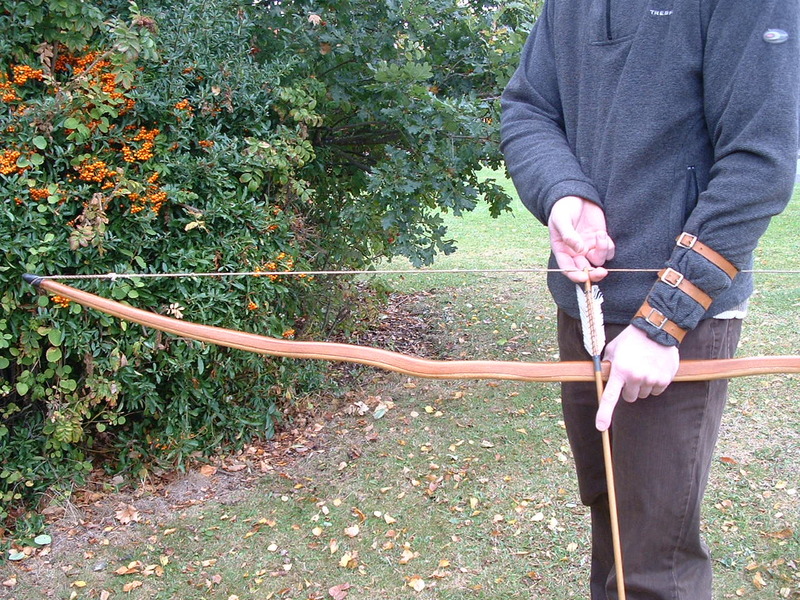 Applying these qualities of sapwood and heartwood to make an efficient self bow is achieved by constructing the self bow so that the sap wood is on the back of the bow (convex) and the heartwood on the belly (concave). 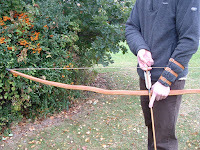 As the string is then drawn back the heartwood is put under compression and potential energy builds up in the limbs, the sapwood on the back, being stretched, takes the tension which helps prevent the bow from breaking. When the string is released the stored potential energy is transferred to the arrow and converted to kinetic energy as the arrow leaves the bow. 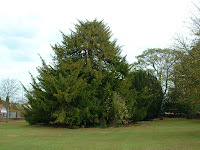 In 10th century Scandinavia the yew-wood used would have been from the European yew, ‘Taxus bacatta.’ As opposed to Irish yew, (‘Taxus bacatta ‘Fastgiata’) a dense stocky columnar tree, that did not exist until 1778/9 when versions of it were first seen growing wild in County Fermanagh and from which all modern Irish yews are descended. 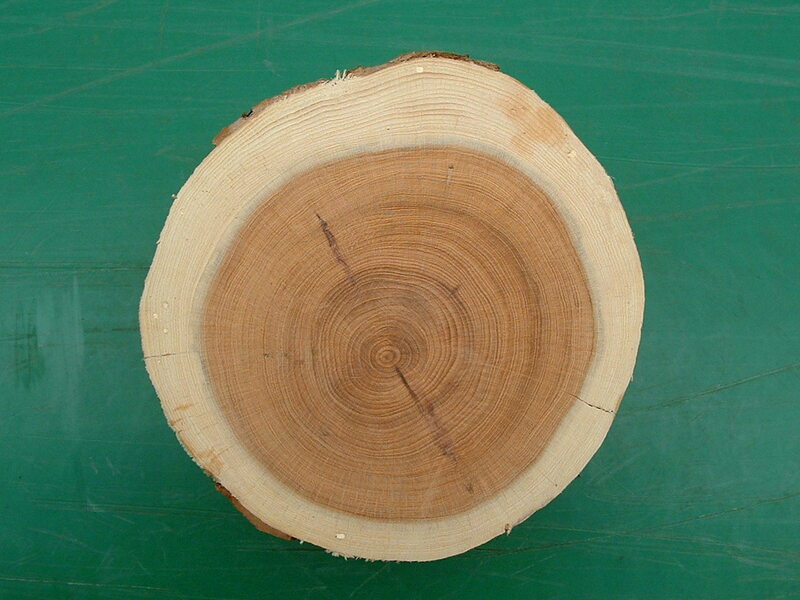 The best yew for making self bows is that which grows at altitude in a dry climate,  where growth is slow and results in a fine-grain (high density of growth rings). It is largely for this reason that England was and is not renowned for producing excellent quality yew-timber,  but rather those countries with a more mountainous terrain and drier climate considered conducive for producing yew of fine grain. 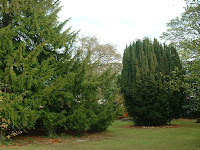 Most bowyers would say that yew-wood is best left to air-dry a few years before using, usually for three or more years, but it is possible to make perfectly serviceable self bows from boughs of yew when green. The difference in relatively poor English open grained wood and foreign yew, in this case Danish or possibly Norwegian close grained yew, can be seen in the two images below. 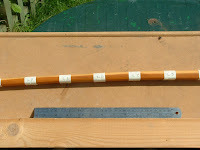 The length of this Danish self bow, crafted by the author, between grooves in horn nocks is: 72.75 inches (184.8 cm), the overall length being (189.1 cm)[74.44 inches], and is of rectangular cross section along its longitude with a regularity of taper. Of the number of historical cross sections that exist, this design is arguably one of the more efficient./ There is no handle as such on this bow as it can be shot either way round. However the limb with the most discernable curve from the centre point was determined as the upper limb. The weight of the self bow after waxing and polishing and not including string is 1.5lbs (660 grams). 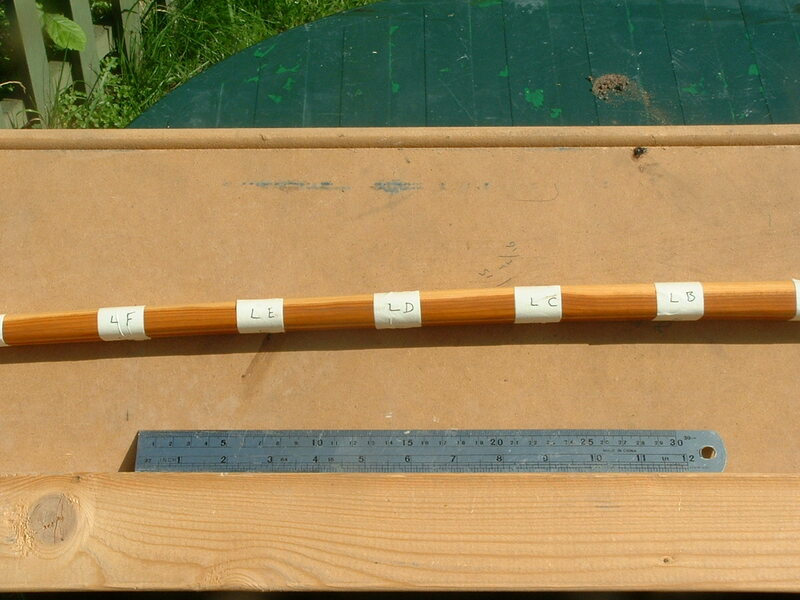 The draw weight being 70lb at 28 inches (31.81 kg at 71.1 cm). nb. 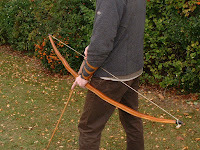 It is not the author’s intention to explain here how best to make a self-bow, not least because there are far more accomplished bow-makers about, and countless other sources who profess to be able to do so, but if this short article has made you want to learn more about making a self bow or even a composite bow for that matter, then that is satisfaction enough. Ascham , R. / Hardy, R.
 Hodgkin, A.E / Milliken, E.K. Hardy, R. / Hodgkin, A.E / Milliken, E.K. Klopsteg P.E. after Hugh Soar from correspondence received when he was Honourable Secretary of the British Longbow Society. Wyse, E. and Winkleman, B. Et al. Johnson H (1973) The International Book of Trees. London: Mitchell Beazley Publishers Limited 1973. Wyse, E & Winklman et al. (1992). Past Worlds, The Times Atlas of Archaeology. Europe after the ice. London: Book Club Associates by arrangement with Times books a division of HarperCollins Publishers. Hardy, R. (1998). 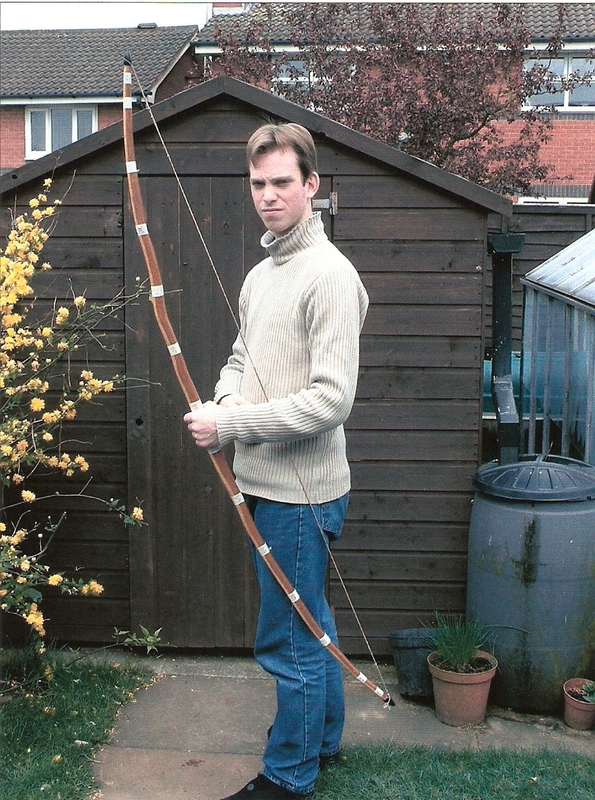 Longbow, A Social and Military History. Yeovil: Patrick Stephens Limited. Milliken, E.K. (1967). Sources of History: Archery in the Middle Ages. London: Macmillan. Richard, G. (1989) Archaeotoxophile. On location at his home in Bonnybridge in Scotland.